A look under the hood of Arturo's 64' Chevy Impala. This month, we’re featuring Arturo Reyes’ ’64 Impala convertible from Alabama. The 29-year-old Arturo spent eight years building his “Firme ’64.” Being employed at a consumer business, Arturo knows all about wheeling and dealing, and how to get the most bang for your buck. He applied those lessons to his project ’64, especially under the hood. Greg at R&N Automotive in Auburn, Alabama, bored out the stock 283-c.i.d. Engine and hooked it up with a new rebuild kit. 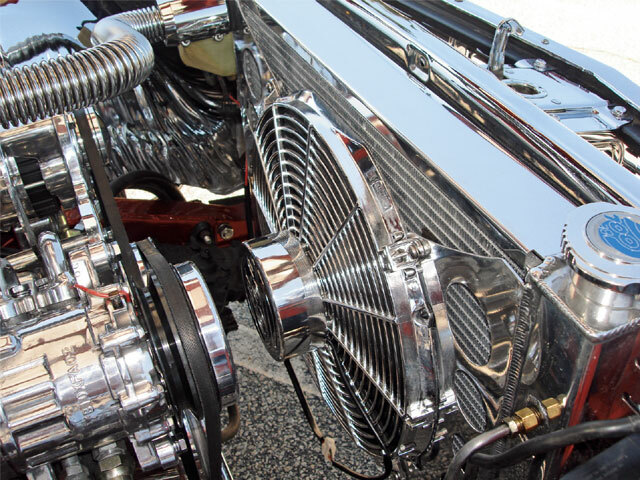 The engine was dressed up with an Edelbrock Air-Gap intake sporting a Permastar finish. 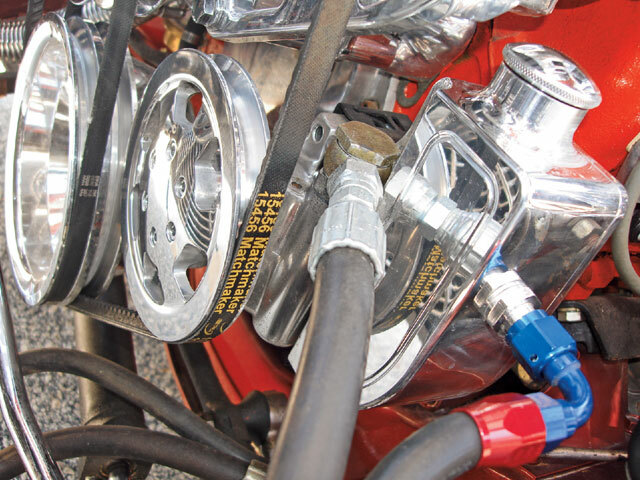 A Holley 650-cfm carburetor was used to satisfy the engine’s appetite for fuel. A modern V-belt system keeps the belts on the right track. Arturo’s long-term build-up was well worth the wait, and we look forward to seeing what’s in store for his new project, a ’60 Impala. Good luck, Arturo, and keep up the good work down there in Alabama. OwnerArturo ReyesVehicle’64 Chevy Impala convertible, “Firme ’64”City/StateOpelika, AlabamaClubObsession C.C. 3. 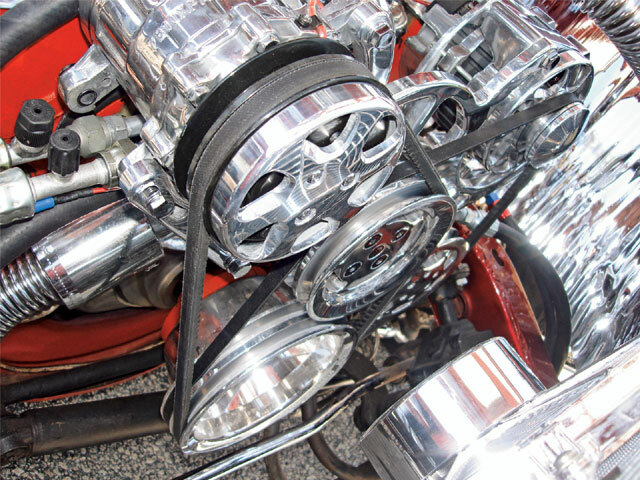 Billet Specialties pulleys and brackets help keep the engine humming. 4. 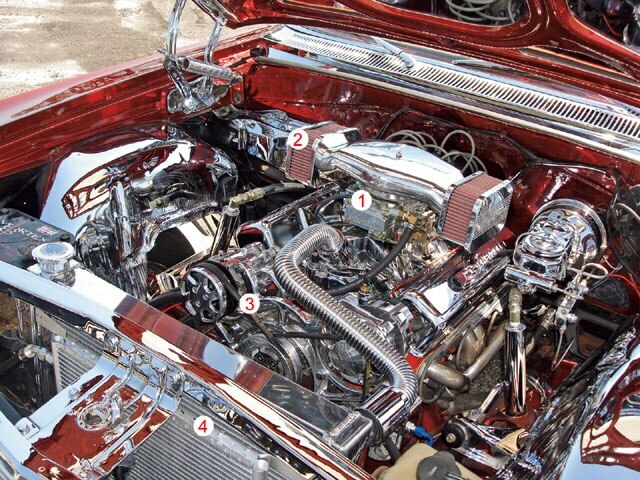 A Be Cool radiator cools the chromedout engine and Cool-Flex hoses keep the fluids flowing. 5. A custom oil reservoir for the power steering unit keeps the plumbing to a minimum.